Updated 12/5/2016 – The contract award amount was corrected. 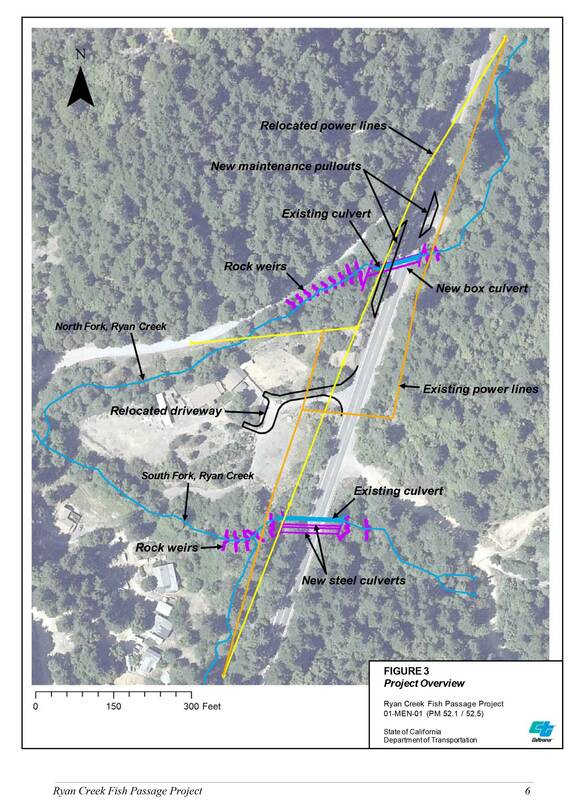 A project to perform mitigation for potential impacts to fish during the construction of the Willits Bypass has been awarded. The low bidder was Mercer Fraser Company out of Eureka, with a total bid of $5.8 million. The project will enhance fish passage by replacing culverts on two forks of Ryan Creek where they pass under U.S. Highway 101. The new culverts will be installed so that they can be filled partly with gravel, resulting in a more natural bottom. This helps fish passage by allowing the creek to flow uninterrupted through the culvert and will open up additional spawning areas on Ryan Creek, which is a headwaters of the Eel River. Construction will begin this fall with the removal of trees necessary to install the new culverts. Culvert replacement will begin next June, with completion by the fall. This project provides mitigation in addition to fish passage and water quality improvements already completed as part of the bypass construction and the wetlands mitigation projects. This entry was tagged caltrans, eel river, fish passage, fisheries, mitigation, ryan creek, Willits Bypass Project. Bookmark the permalink.